[242 Pages Report] The overall cell counting market is expected to grow from USD 8.29 billion in 2017 to USD 12.31 billion by 2023, at a CAGR of 6.8% from 2018 to 2023. Cell counting plays a vital role in cell analysis it helps identify the viability of cells and cell growth, and quantifies the number of live or dead cells in cell culture. The advantages of improved image analysis and the growing use of high-throughput flow cytometry and automated hematology analyzers are aiding the growth of the market. The cell counting market is expanding with the emergence of new technologies and increasing applications areas. These instruments are being used in various research, clinical & diagnostic, and industrial applications. Many life science companies are under pressure to maintain their existing profit margins and improve them in the future while facing enormous pressure to cut prices. This has led to dramatic shifts in the business models of some manufacturers in this industry. The base year considered for the study is 2017, and the forecast has been provided for the period between 2018 and 2023. Technological developments improve the overall performance of flow cytometry instruments and enable users to analyze and perform complex multi-parametric analysis. Major developments such as the emergence of imaging flow cytometry (IFC) technology, which enables morphological analysis along with the fluorescent imaging of cell and cellular activities has led to the higher adoption of these instruments during cell analysis procedures across industries. Similarly, automated hematology analyzers, as compared to non-automated analyzers, are more scalable, meet high-performance levels, decrease the hands-on time of operating personnel, eliminate batch testing, and deliver faster results to physicians. These advantages have led to the increasing adoption of these instruments. The launch of miniaturized and automated hematology analyzers offering advanced functionalities is expected to generate significant interest among end users. Furthermore, the integration of flow cytometry in hematology analyzers has made the analysis of blood samples more efficient and useful for research and diagnostics applications, which has driven their overall adoption and thereby supported market growth. During this research study, major players operating in the cell counting market in various regions have been identified, and their offerings, regional presence, and distribution channels have been analyzed through in-depth discussions. Top-down and bottom-up approaches have been used to determine the overall market size. Sizes of the other individual markets have been estimated using the percentage splits obtained through secondary sources such as Hoovers, Bloomberg BusinessWeek, and Factiva, along with primary respondents. The entire procedure includes the study of the annual and financial reports of the top market players and extensive interviews with industry experts such as CEOs, VPs, directors, and marketing executives for key insights (both qualitative and quantitative) pertaining to the market. The figure below shows the breakdown of the primaries on the basis of the company type, designation, and region considered during the research study. The prominent players in the global cell counting market are Danaher Corporation (US), Thermo Fisher Scientific (US), Becton, Dickinson and Company (US), Merck (Germany), Bio-Rad Laboratories (US), GE Healthcare (US), PerkinElmer (US), Agilent Technologies (US), BioTek Instruments (US), Tecan Group (Switzerland), Roche Diagnostics (Switzerland), Sysmex Corporation (Japan), HORIBA, Ltd. (Japan), Abbott Laboratories (US), and Siemens Healthineers (Germany). In May 2018, Danaher Corporation launched the DxH 900 hematology analyzer, giving mid- to high-volume clinical laboratories the ability to perform complete blood count and white blood cell differential tests with minimal repeats. In April 2018, BioTek Instruments collaborated with Agilent Technologies to create a new integrated metabolic analysis and imaging platform by integrating Agilent Seahorse XFe96/XFe24 Analyzers with the BioTek Cytation 1 Cell Imaging Multi-Mode Reader to improve assay workflow. In February 2018, Merck invested USD 19.51 million (EUR 16.6 million) in its new manufacturing and distribution centre for the Life Science business located in Mumbai to be completed in 2019. This will strengthen the company's overall manufacturing and supply chain infrastructure. What are new application areas which the cell counting companies are exploring? Further breakdown of the Latin American cell counting market into Brazil, Mexico, and others. The overall cell counting market is expected to grow from USD 8.84 billion in 2018 to USD 12.32 billion by 2023 at a CAGR of 6.8%. The growing incidence of diseases and blood disorders, development of enhanced solutions and improved image analysis, and growing use of high-throughput flow cytometry and automated hematology analyzers are the key factors driving the growth of this market. Cell counting is a subset of cytometry and plays a vital role in cell analysis and cell research during various research and diagnostic applications. It ensures the viability of cells and cell growth. It also quantifies the number of live or dead cells in a cell culture. A wide number of cell counting instruments and consumables are used during the diagnosis of several diseases, including AIDS, cancer, and several infectious diseases and during cell-based research, stem cell research, cancer research, and AIDS research. Over the years, with the increasing research being held in various fields along with the increasing importance of timely and accurate diagnosis, the market for cell counting instruments has witnessed significant growth. The cell counting market has been segmented, on the basis of product, into consumables and instruments. The market for consumables is expected to grow at the highest CAGR between 2018 and 2023. On the other hand, among all the instruments, spectrophotometers are most widely used for cell analysis. The high adoption of these instruments is contributing to the rapid growth of the market. The cell counting market in APAC is expected to grow at the highest CAGR during the forecast period. With significant growth in the research industry in the past few years, China and India have emerged as high-growth markets for cell counting instruments. Other than these APAC countries, Brazil also shows significant growth potential for the cell counting market. A majority of this growth is driven by the significant growth in the healthcare market as well as the research industry in these regions. 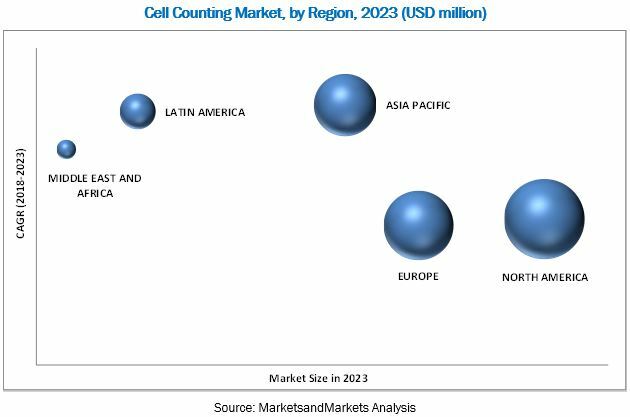 The low-cost manufacturing advantage, increasing per capita income, and low regulatory stringency are also factors supporting the growth of the cell counting market in these regions. Cell counting is utilized in life science research, medical diagnosis, and treatment. Cell count is one of the important aspects of any cell-based research, as having insufficient or excessive cells can affect the results/output of the experiment. Processes that require accurate and consistent numbers of input cells include transfection, cell proliferation or viability studies, and qPCR. Increasing research in the field of immunological disorders (due to their rising prevalence), drug discovery, stem cells, and in vitro cytotoxicity testing support the demand for instruments and consumables. The use of various cell counting instruments in clinical and diagnostic applications can mainly be attributed to the multi-parametric approach of testing enabled by these instruments. Moreover, the increasing prevalence of such as cancer, blood-related disorders, infectious diseases, and HIV/AIDS and availability of enhanced reagents serve to support market growth. Advancement in flow cytometer technology and integration with hematology analyzers has made the analysis of blood samples and detection of blood-related diseases faster and more accurate. Cell counting has a significant importance in the food, dairy, environment, and microbial industries for the enumeration of microorganisms to distinguish between dead, viable, and metabolically active cells. These instruments are used to rapidly count yeast, bacterial cells, and molds in food products and in the fermentation industry for monitoring cell culture and detecting microbes in milk, detecting pathogens in the early stages, and cytotoxicity assays of various food ingredients. What are the upcoming industry applications for cell counting? The advanced instruments such as flow cytometers, multimode microplate readers, and automated hematology analyzers used for cell counting and other cell analysis applications are highly expensive. This is a major factor restraining the growth of the market. The high prices put these instruments out of reach for companies with small R&D budgets and academic institutes lacking financial backing. Maintenance costs and several other indirect expenses also add to the total cost of ownership. Currently, the majority of the governments across developed and developing countries are focusing on cost-cutting measures, which further threatens the adoption of high-priced cell counting instruments in both clinical and research applications. Key players in the market include Danaher Corporation (US), Thermo Fisher Scientific (US), Becton, Dickinson and Company (US), Merck (Germany), Bio-Rad Laboratories (US), GE Healthcare (US), PerkinElmer (US), Agilent Technologies (US), BioTek Instruments (US), Tecan Group (Switzerland), Roche Diagnostics (Switzerland), Sysmex Corporation (Japan), HORIBA, Ltd. (Japan), Abbott Laboratories (US), and Siemens Healthineers (Germany). These players are increasingly undertaking product launches to develop and introduce new technologies, expansions, mergers and acquisitions, and agreements to alleviate their market position.